Hi friends! I have been totally absent for the past few days, but with good reason - I was sick! Plus a busy weekend, which I will catch you up on this week with make-up posts. Anyhoo, this is an awesomely tasty and equally awesomely easy dish to make. I mean, when something has five ingredients, how can it really be that hard? It can't! So this is what you want to make when you have no time, and want a filling, yet light meal. I love this meal because it is all veggies and protein. That combination fills me up and always makes my body feel good. It also makes me feel good because it requires no work. Did I mention that? Oh I did? Well, then what are you waiting for? Go make this! *Heat a small amount of olive oil in a large skillet. Throw all the veggies into the pan and stir occasionally, allowing them to cook up. Sprinkle garlic powder and salt and pepper on top. *In a separate skillet (smaller), heat a small amount of olive oil. Place chicken sausages in and cook for a few minutes, until lightly browned and both sides. *Combine in a bowl or plate and serve immediately! For some extra color and flavor, heat up some frozen peas in the microwave and toss them into the skillet combo! 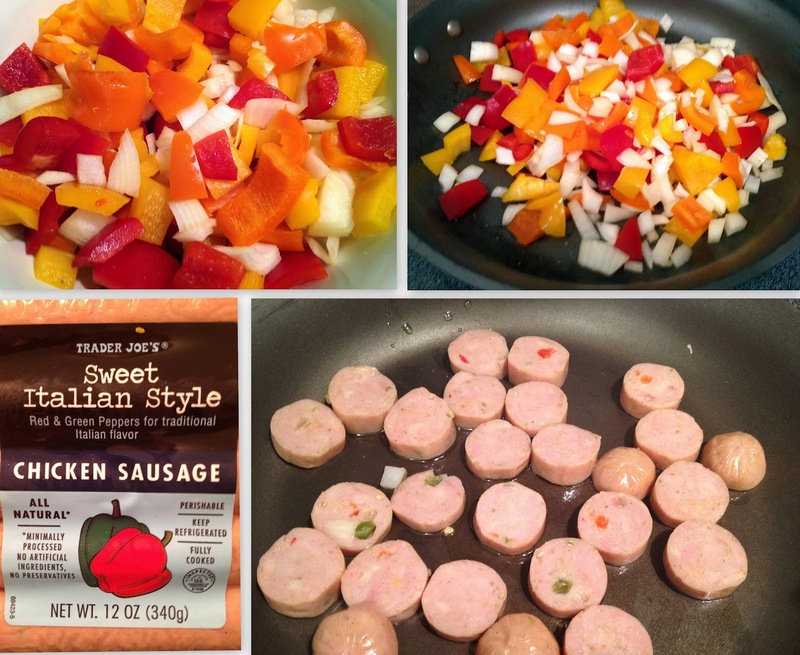 Chopped and cooking veggies...plus the chicken sausage I used - so tasty!